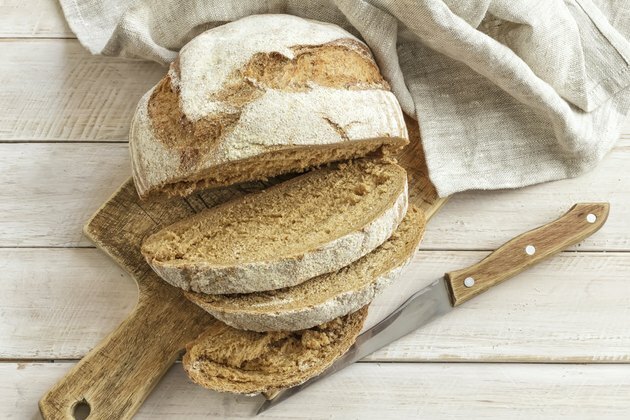 Can You Eat Bread If You Have Gout? Gout occurs when excess uric acid in your blood forms crystals that accumulate around a joint, causing a painful arthritic condition. Because uric acid is formed from the breakdown of purines, people with gout commonly follow a low-purine diet. A regular diet contains anywhere from 600 to 1,000 milligrams of purines per day. A low-purine diet restricts you to between 100 and 150 milligrams daily. Because yeast is high in purines, bread can be a gout trigger for some people. Purines are found in many foods, but are particularly high in meat, seafood, alcohol and yeast. A general guideline is that you can usually consume enriched breads without triggering a gout attack. However, this isn't true for everyone. Whether you need to limit your bread consumption depends on how well your gout is controlled. Advances in gout medications have allowed people with gout to eat foods that were once forbidden. Talk to your doctor to help determine whether you need to restrict your bread intake.